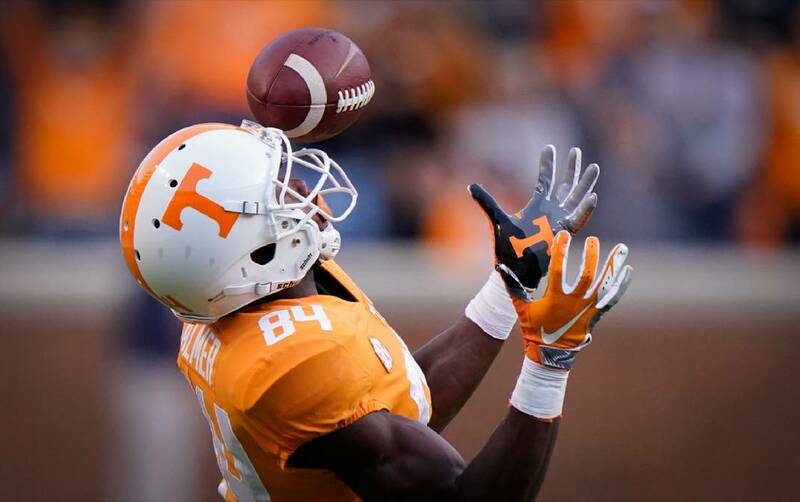 Tennessee's Josh Palmer bobbles the football before getting control for a catch during last Saturday's 14-3 win against Charlotte at Neyland Stadium in Knoxville. Tennessee wide receiver Josh Palmer turns upfield during the Vols' game at Georgia on Sept. 29. Midway through the third quarter of last Saturday's game against Charlotte, the Tennessee offense needed a spark. The Volunteers led 14-3 but were not having much success moving the football. To try to change that, the coaches called a flea flicker. The play started with promise, but a big hit on quarterback Jarrett Guarantano caused him to fling the ball dangerously high up in the air toward his favorite downfield target, Josh Palmer. Palmer could have panicked, losing the ball in the sky, but instead positioned himself for the pass that looked more like a punt and brought it in for a 45-yard gain. "The ball was high, so I just had to focus in and catch it," Palmer said. "There was a weird rotation on the ball, so I had a lot of time to size it up. I didn't know what happened, but I just knew that I had to catch it, and the DB (defensive back) tripped, which made it easier." The native of Brampton in Ontario, Canada, has not had an easy road at Tennessee. While a lot of players have productive freshman seasons followed by what is often referred to as a "sophomore slump," Palmer has had the opposite happen to him. He stepped on campus in 2017 with high expectations but struggled to fit into the offensive system early on. That, along with coaching turnover, caused him to struggle with earning playing time. Palmer had nine receptions his freshman year for 98 yards and failed to score a touchdown. However, with a new coaching staff and a new attitude, he has thrived in 2018. "I've gained a lot of knowledge from my freshman year to my sophomore year, so the game is slowing down a lot more now," Palmer said. "Coach (Jeremy) Pruitt is really hard on me on high pointing the football, so going into every game and practice now, that's what I'm focusing on doing." While fellow wide receivers Marquez Callaway and Jauan Jennings are Guarantano's favorite targets on short and medium passes, Palmer has established himself as the most significant deep threat on the team. Palmer has averaged more than 23 yards per catch this season and has seven receptions exceeding 30 yards. And he finally scored his first college receiving touchdown at Georgia. 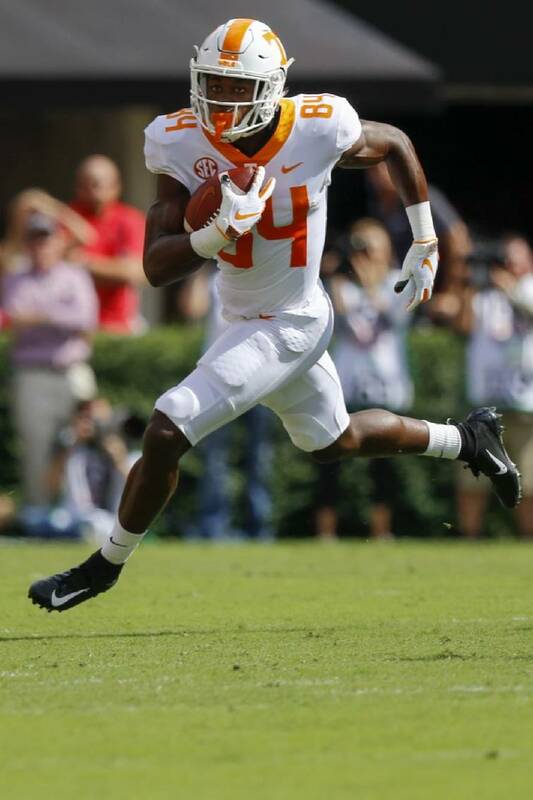 The 37-yard play gave a noticeable boost to the Vols' offense in the 38-12 loss on Sept. 29. The game after, Palmer had three receptions for 84 yards in the Vols' upset win at Auburn, including a 42-yard reception on a third down that kept what proved to be the go-ahead drive alive. In last Saturday's win over Charlotte, he had a collegiate career-high four catches for 71 yards and a touchdown. Palmer, who didn't really commit to playing football until his sophomore year of high school, has impressed Pruitt. "Josh hasn't played a lot of football, so there's lots to learn for him every day," the first-year head coach said. "He has ability as well as having good size. I think that his best football is in front of him as long as he chooses to work hard and compete. I think that he'll continue to improve." With that belief, Pruitt has challenged Palmer in practice more than most of his teammates. Some of his fellow receivers have challenged him as well, trying to have Palmer see how high his ceiling can be. "We just try to make him see it himself," Callaway said. "Once he figures that out, he's going to be an even better monster than he is right now. We're always in his ear. Not just us, but the coaches. We want him to be the best he can be." Contact Rob Harvey at sports@timesfreepress.com.